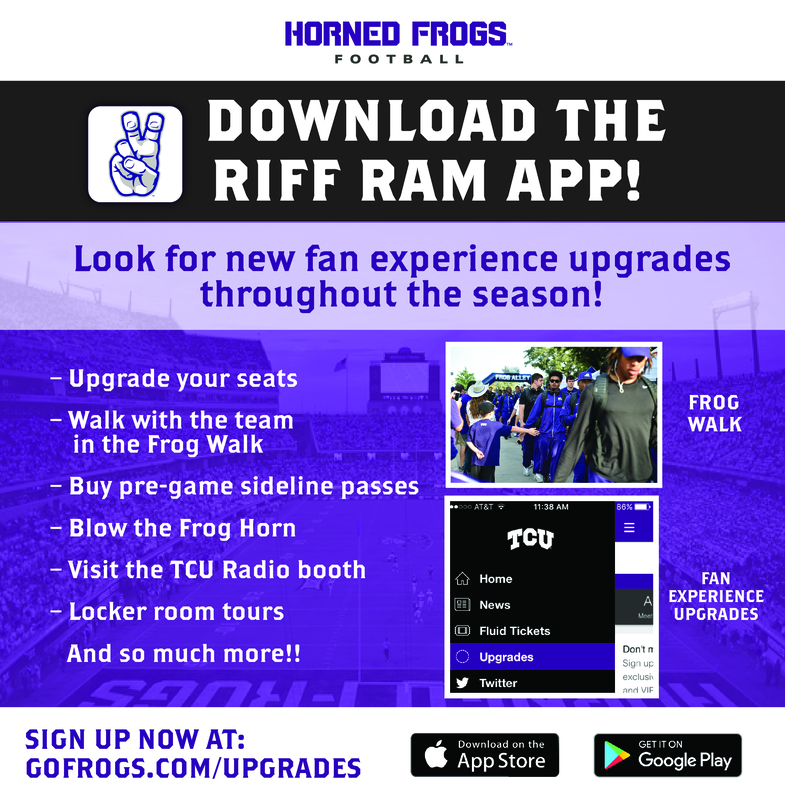 You are eligible to receive Horned Frog Priority Points for this gift. Priority Points determine seating, priority parking and other benefits associated with TCU Athletics. If points are accepted, your income tax charitable deduction may be limited under IRS Code Section 170(1). Please consult your tax-advisor regarding the deductibility of your gift. Do you wish to receive Horned Frog Priority Points for your gift? When you make a recurring gift, the first charge to your credit card will be the day of the month, quarter, or year you specify. (e.g. Day 3 of every month on a gift setup on June 13 will charge the first payment on July 3). If your first gift date is in the future, you will see $0 gift amount on the following page. introB This is intro text two (B). introC This is intro text three (C). This is intro text three. This is intro text three. This is intro text three. This is intro text three. This is intro text three. This is intro text three. This is intro text three. This is intro text three. This is intro text three. This is intro text three. This is intro text three. Thank you for making a gift to TCU! You may wear purple before game days, sport the latest TCU sticker on your car or display Horned Frog memorabilia at your office. Here's another way to show your support and have an impact on the University's future: by making an annual gift of any size today! 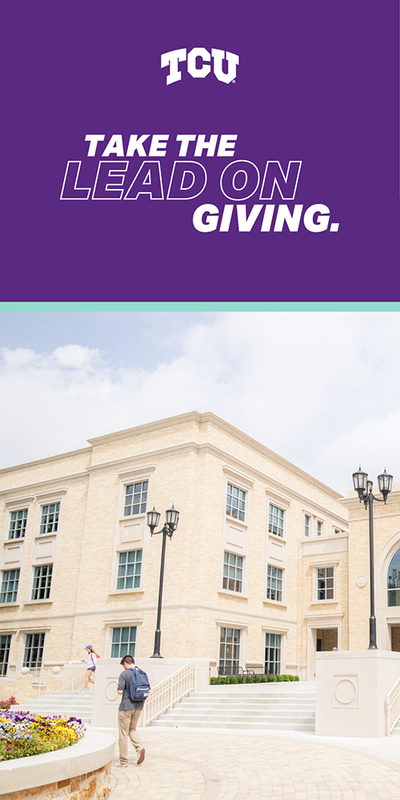 Without a doubt, annual gifts underwrite every element of the TCU experience, from strengthening academic programs and building scholarships to supporting faculty. Your participation counts, not just in dollars, but also as a vote of confidence in the University. 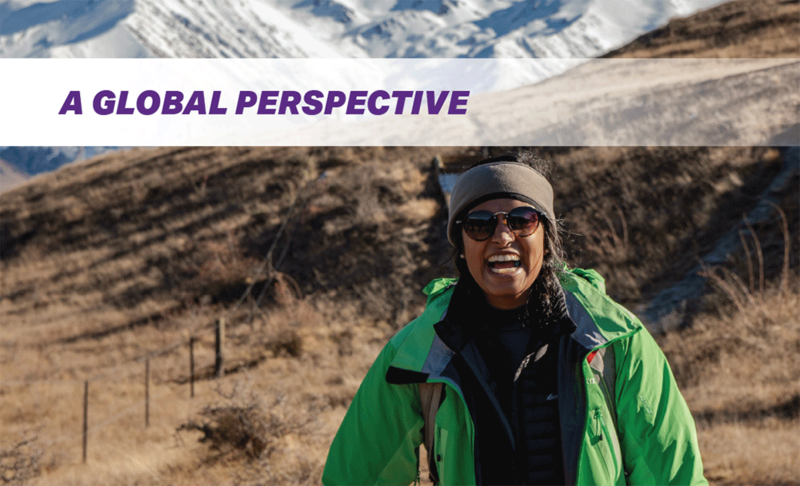 Your investment means TCU can make a difference in the global community today and ensures it will continue to improve for future generations to come! You may wear purple before game days, sport the latest TCU sticker on your car or display Horned Frog memorabilia at your office. 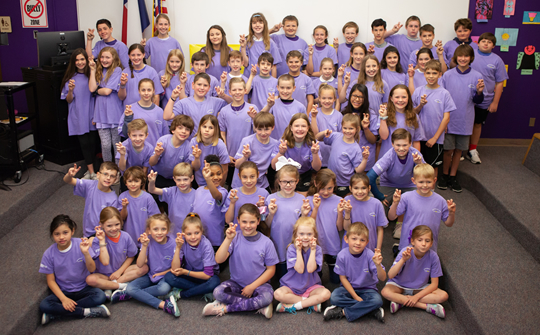 You can be a partner in helping the Neeley School build a bold future today! The business school building expansion project is well under way. The new east and south wings, a central atrium, office complex, auditorium, and landscaped business quad will fuel the competitive advantage for the Neeley School as it becomes a premier global business school. 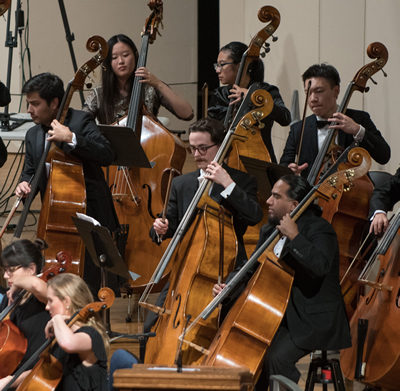 TCU is proud to be home to the TCU School of Music, an internationally recognized and award-winning community featuring distinguished faculty and a talented and diverse student body. Driven by their mission to foster excellence in performance, teaching, creativity, and scholarship, the profile and reputation of the TCU School of Music continues to grow, attracting students from across the nation and around the world. Over the past 15 years, the TCU School of Music has doubled the number of students in our programs. 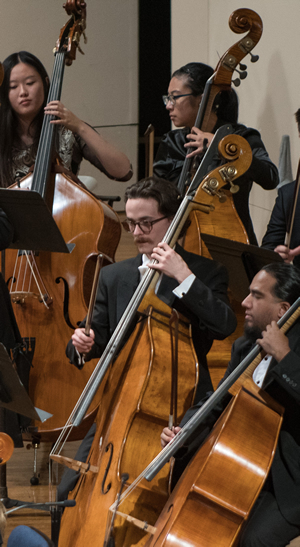 Your support will help us continue to attract the most talented and creative students, keeping us competitive amongst peer institutions and strengthening TCU’s overall academic reputation. Coming in the fall of 2019! Under Chancellor Boschini's leadership, Texas Christian University has seen monumental accomplishments and yet continues striving to raise the level of expectations. This capital project cements our momentum in the landscape of college athletics and provides Horned Frogs a special social space to connect. Set to be one of the finest and technology-driven spaces in intercollegiate athletics, it will be designed not only to be a state-of the-art facility on Saturday’s in the fall, but provide a unique venue to be utilized throughout the entire year. Please consider supporting the Amon G. Carter Stadium expansion project in any capacity. Your contributions will directly impact the TCU Football program. Additional revenue generated from this facility will also be reinvested into other areas of the university. Thank you for helping us reach our goal of $100,000! Double your donation of up to $25,000 by May 27, 2018! As of May 8, 2018, we’ve raised $25,000 of our $100,000 goal! Colonial Kids for a Cause LemonAid Stand is a group of philanthropic Fort Worth children who have for the past eight years convened during the Colonial Golf Tournament to help raise money for various local charities through an amazing larger-than-life LemonAid stand! The children run this show, with minimal help from parents. This is an invaluable experience for the children in what it means to give back to their community and how to start and run a "business." The Colonial Kids have raised over $175,000 for local charities since 2010. Every year, the children gather and listen to a handful of non-profit charities stories and they vote to see who they will support for the upcoming year. This year, the Kids of Colonial Kids for a Cause are pleased to request your support as they raise awareness and funds for the amazing Starpoint School. We need your help establishing an endowed scholarship that will benefit Starpoint students for years to come! To make this year’s LemonAid Stand the most successful EVER, we humbly ask that you make a donation to Starpoint using this online fundraising page. 100% of your donation will go directly to the students at Starpoint. Double your impact. 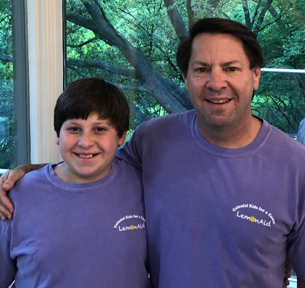 In honor of his son, Robbie Baker has generously agreed to match, dollar for dollar, all donations through May 27, 2018 up to $25,000! Make your gift go twice as far and give today! In past years many of our wonderful friends and sponsors have wanted to come by and contribute but sometimes it’s hard to get to the "stand" during Colonial Saturday. The Colonial Kids will be so grateful and so will our friends at Starpoint! Thank you to The Burnett Foundation for your $25,000 commitment to the kids of Starpoint! As of May 8, 2018, we’ve raised $25,000 of our $75,000 goal! Ron Watson came to TCU in 1982 as the Chairman of the Department of Art & Art History. In the thirty years that Ron was a member of the faculty and chair he made significant contributions to the School by leading us through NASAD accreditation and bringing to reality a contemporary art gallery amongst many other things. We are sad to note that Ron passed away recently after a long battle with cancer. As a way to honor Ron and his exceptional contribution to the TCU School of Art and Fort Worth, a group of alumni and friends have come together to purchase one of Ron’s final works to become a part of the University’s permanent collection. The artwork that is purchased will be displayed inside the Moudy North building. We hope you will join us to help us make this a reality and contribute today. Please see the information below to make a gift in memory of Ron and the impact he had on so many students during his time at TCU. Under Tribute Information, select “In Memory Of” under type, and then add Ron Watson in the name field. Our mission is to bridge the gap between academics and the social, emotional and healthy well-being of children. The LiiNK Project aims to develop the whole child through increased recess and character development. We appreciate your interest in the drive behind LiiNK! Every dollar you give helps us introduce and create a culture shift in the schools to remember kids need to be kids! The outdoors is a natural classroom. Children and teachers need breaks throughout the day. Children and teachers are happier and less anxious as a result of these policy and procedural changes in the schools. Lock in your loyalty! Set up recurring giving. Thank you for making a gift to the TCU Department of Social Work! Your gift helps us provide students with resources that strenghten their TCU Social Work experience. Our mission is to education ethical and competent social workers who promote human rights and social and economic justice in the global community. Your support helps us live up to that mission, continuing our 40-year legacy of excellence in social work education. Thank you for making a gift to An Evening of Great Conversation! 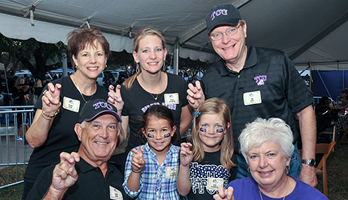 Your gift helps us provide students with resources that strenghten their TCU experience. Thank you for making a gift to TCU’s School for Interdisciplinary Studies. Our mission is to empower change agents to tackle big questions by integrating diverse perspectives, disciplines, and methods of inquiry to promote empathy, respect, and justice. We appreciate your interest in supporting Interdisciplinary Studies. Every dollar you give helps us in our efforts to enable scholarly and radical collaborations and to model deep integrated learning that connects TCU’s academic community to our broader communities. Thank you for making a gift to the TCU Collegiate Recovery Program! Our mission is to enhance the academic success of TCU students in recovery and seeking recovery from addiction by providing a genuine college experience in the absence of alcohol, cannabis, and other substances. Being sober on a college campus can be extremely difficult; your gift will help support our mission by giving students opportunities to have sober fun and to share their experience, strength, and hope with their peers and with the TCU community. We believe recovery is possible, no matter what the age or circumstance. Fill in the amount and designation below and click “Add gift.” You can add multiple gifts and designations in a single transaction by clicking “Add gift”. Once you’ve added a gift, you can set up recurring giving by choosing “Recurring gift” as your type of gift. sidebarB sidebar is sidebar text two (B). sidebarC This is sidebar text three (C). This is sidebar text three. This is sidebar text three. This is sidebar text three. This is sidebar text three. This is sidebar text three. This is sidebar text three. This is sidebar text three. This is sidebar text three.